Unknown1:34 PM 0 sweets for free! 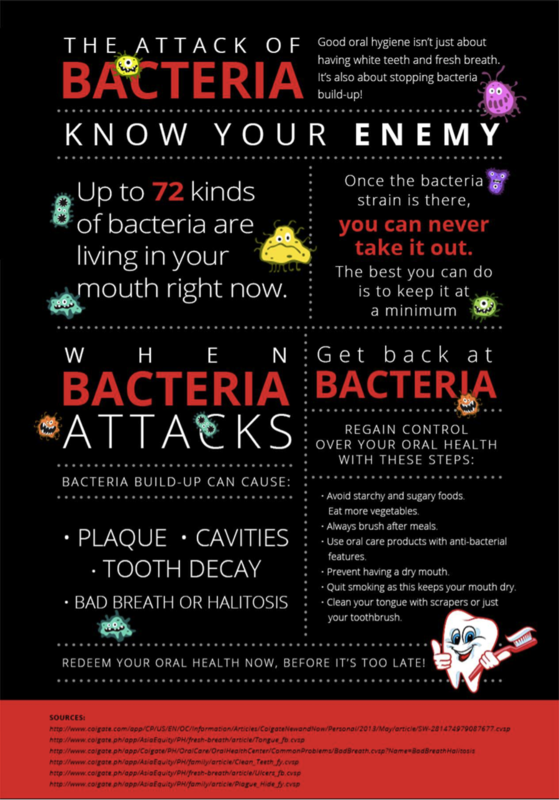 Good oral hygiene begins and ends with bacteria. Start with a healthy environment for good bacteria to grow, and maintain this regimen by preventing bad bacteria from accumulating and causing plaque, cavities, and bad breath. Win the fight against the bacteria in your mouth with oral care habits, starting with the food you eat. Avoid sugary and starchy food, consume more vegetables, and drink your eight glasses of water a day. After eating, always brushing your teeth, use oral care products with anti-bacterial features, and clean your tongue with scrapers or your tooth brush. By knowing the enemy of good oral hygiene, you can easily win the fight against it.